In Roman Catholicism, the first Mass of a newly ordained priest is a major festivity. 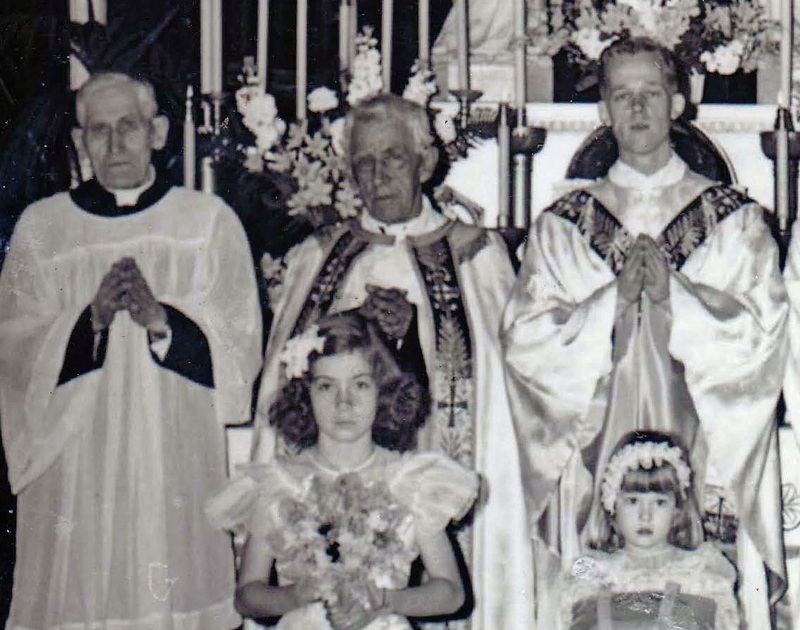 The photo below was taken in Immaculate Conception Church in Jefferson City, MO, on April 6, 1948, at the first Mass of Father John (Jack) Westhues (1922-2008), great-grandson of Theresia Peters, grandson of Wilhelm and Theresia Peters Westhues, son of Judge Henry and Helen Westhues. Standing beside Father Jack are his great-uncles, Theresia Peters's priest-sons, Father John (at left; 1875-1955) and Father Fritz (in center; 1873-1956). The little girl in front of Father Jack is his niece Susan Rieke, Theresia's great-great-granddaughter, who would spend her adult life as a Sister of Charity of Leavenworth. As of 2016, Sister Susan is Professor of English and McGilley Chair for Liberal Studies at the University of Saint Mary. The girl in front of Father Fritz is Joan Oidtman (1936-2012), a great-grandaughter of Theresia Peters, who became not a nun but a nurse and mother; she and her husband, Kansas State English professor Bill Brondell, became parents of seven children.